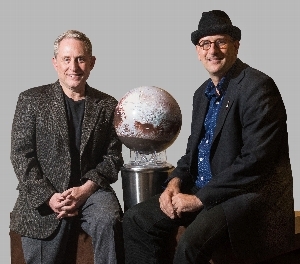 The principal investigator of the New Horizons mission to Pluto, a planetary scientist, and an aerospace executive and consultant, Dr. Alan Stern has participated in a mind-blowing 29 space missions and has served in the loftiest strata of contemporary American space exploration. The chair of astrobiology at the U.S. Library of Congress, Dr. David Grinspoon studies climate evolution, the conditions for life elsewhere in the cosmos, and space-exploration strategy. He has consulted on interplanetary missions for several international space agencies and is on the team for NASA’s Curiosity Mars Rover. He is the author of Earth in Human Hands, a “remarkable synthesis of natural history, planetary science, extinction histories … and the human effect on the world” (Forbes). In Chasing New Horizons, Stern and Grinspoon go inside and then beyond the science, politics, and egos of the 3 billion-mile trip to the edge of our solar system for the once-in-a-lifetime 32,000-miles-per-hour flyby of Pluto.